I got 2 cards made, I was going to say today, but I see it's after midnight, so I got 2 cards made yesterday. It started raining at 4:30 a.m. yesterday morning and has been raining steadily all day. I am so glad we are at the top of the hill in our neighborhood because I know in my heart that our house we moved from 3 yrs. ago because of flooding is probably flooded. Onto my cards, cause I think they turned out pretty cute. 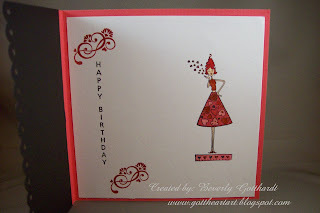 The 3rd challenge is for Mothermark's Happy Birthday over at http://cceestampers.blogspot.com she loves polka dots and teapots, hope she enjoyed her birthday cause this is late, but it's the thought that counts. The sketch is from http://thepinkelephantchallenge.blogspot.com they were the first challenge I ever entered, so I like to credit those ladies for helping to create this challenge junkie. 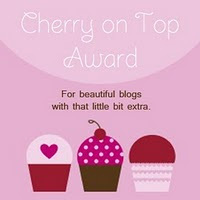 The 2nd challenge is back over at http://cceestampers.blogspot.com it is for their regular Monday challenge and it is CNFS-Sparkle Girl. We were to include the Faux Silk technique on our card, and since I had never tried this before it was a neat challenge within a challenge. It is the middle panel on the front of the card, I think it turned out pretty neat and I'll be using this technique some more. It was fun, there is a clickable link on the cceestampers blog for the instructions. Supplies for Card 1: Stampin Up papers: Soft Suede, Handsome Hunter, Sage Shadow, Blush Blossom, Card is cut from Soft Suede 7" X 10" and folded in half, white tissue paper, UHU Glue Stick, pink and white polka dot paper from my stash, Inks: Ranger Archival Ink-Jet Black, Whispers: Chestnut, Stampin Up: Whisper White, touch of pink water color, VersaMark Ink Pad, Zing! 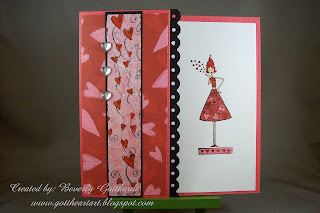 Opaque Embossing Powder: Brownie, CTMH marker: brown bag, Stamps: MFT Stamps-You Take the Cake, Rubbernecker Stamps: Sm. Tea Cup w/Heart, Lg. Teapot w/Hearts. 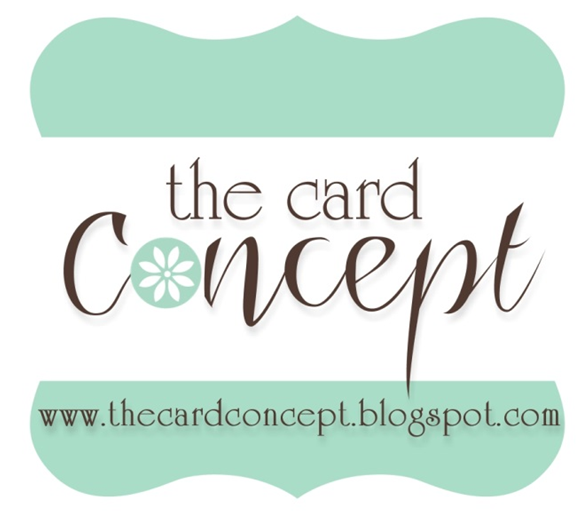 Stampin Up: Sizzix texture plate-Lg. Dots, Cuttlebug Embossing Folder: Swiss Dots, Fiskars Punch: Threading Water, ribbon Hobby Lobby, acrylic heart bubbles, pop dots. Supplies for Card 2: Card cut 6" X 12" folded in half from red textured card stock, white card stock, black card stock from my stash, Chatter Box Inc: Pink on Red hearts Designer paper, white tissue paper, UHU Glue Stick, Stamps: Inkadinkado: Heartstrings background stamp, Great Impressions: G244 Heart Girl, CTMH: C1257 Happy Birthday, D1309 Heartthrob, Michael's: Rhinestone stickers, Inks: Ranger Archival Ink: Jet Black, CTMH: Z2116 Cranberry, Marvy LePlume: pale pink, crimson lake, bubble gum pink, CTMH markers: cranberry, baby pink, hollyhock, blush, Sakura Gelly Roll pen: Clear Star, Fiskars Punch: Threading Water. It seems like alot of supplies when I list them like this. There's lots of talent on all these challenges, hope you browse around and admire everybodys pretties. Wonderful cards! Thanks for joining us at TPE challenge this week! Both of your cards are great, but I like the teapot one best - the images you used are adorable! Thanks for playing along this week on the 411! Love both of your cards!! Thanks for playing along this week!! 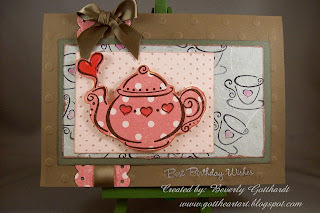 love the teapot card--glad to see you back in your studio! Oooo, ooo, I love these images. So cute! Thanks for creating with TPE this week. Wonderful work, both are so cute. Great job on the color challenge! So happy you could play along with the OCC this week. Hope to see you back with us again next week. oh wow just gorgeous. Thanks for joining the TPE challenge this week with such lovely creations. Wonderful card!! Great take on this weeks sketch!! Thanks for playing along with us at The Pink Elephant! !